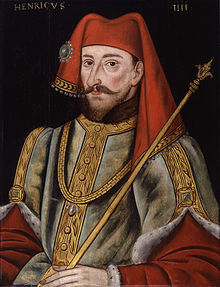 Henry IV (April 3 1367 – March 20 1413) was a King of England. He was born at Bolingbroke Castle in Lincolnshire, which is why he was often called "Henry Bolingbroke". His father, John of Gaunt, was the third son of King Edward III, and had a lot of power in the reign of King Richard II. Henry and Thomas de Mowbray, 1st Duke of Norfolk argued in 1398. King Richard ordered Henry to live outside England for ten years (with the approval of Henry's father, John of Gaunt) but Thomas de Mowbray was exiled from England for life. The next year John of Gaunt died, and Richard would not allow Henry to inherit Gaunt's land. Instead, Henry had to ask for the lands from Richard. Henry met with the exiled Thomas Arundel, former Archbishop of Canterbury. Henry and Arundel returned to England while Richard was on a military campaign in Ireland. With Arundel as his advisor, Henry Bolingbroke began a military campaign, took land from those who opposed him and ordering his soldiers to destroy much of Cheshire. Henry gained enough power and support to have himself declared King Henry IV. He sent King Richard to prison (who mysteriously died in prison) and by-passing Richard’s seven-year-old heir presumptive Edmund de Mortimer. Henry was crowned on 13 October 1399. It was the first time since the Norman Conquest in 1066 that the monarch made a public speech in English. Henry consulted with Parliament frequently, but was sometimes at odds with them, especially over religious matters. On Arundel's advice, Henry was the first English king to allow the burning of heretics, mainly to suppress the Lollard movement. This page was last changed on 5 October 2018, at 07:09.